Looking for highlights of Ontario’s thriving biosciences cluster? Check out an engaging new report — available in English and French and coinciding with National Biotechnology Week this week — produced by MaRS and the Ontario Ministry of Research and Innovation. The 40-page report is part of larger strategy to market the province’s new Biopharmaceutical Investment Program and strong biopharma cluster, which has grown to become the third largest in North America. 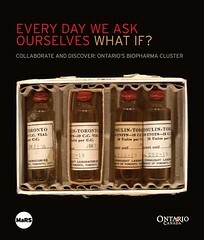 With an arresting cover image of vintage insulin vials, the report, subtitled “Collaborate and Discover: Ontario’s Biopharma Cluster”, takes the reader from Banting and Best’s seminal discover through to profiles of today’s leading researchers and early-stage companies — in stem cell biology, neuroscience, genomics and beyond.